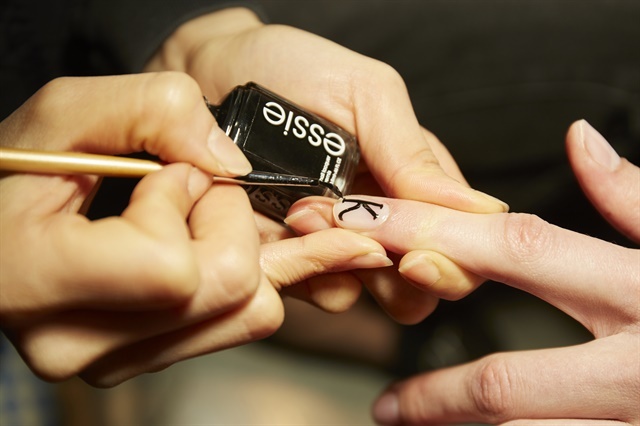 Inspired by the headlines printed across various pieces in Jeremy Scott’s New York-themed Fall/Winter 2019 show, Miss Pop for Essie created four graphic looks. “I’m calling these extra, extra nails — a pop art twist on traditional newspaper type,” she says. 1. Apply Here to Stay base coat for a smooth polish application. 2. Add two coats of Blanc or Licorice to nails. 3. After the polish dries, use a fine detail brush dipped in Licorice or Blanc to write out “New York” on seven fingers. Using a dotting tool, gently press a small circle near the cuticle on the remaining three fingers. 4. After all nails are dry, set with a generous amount of Speed.Setter top coat. 5. Finish by moisturizing skin with Apricot Cuticle Oil. 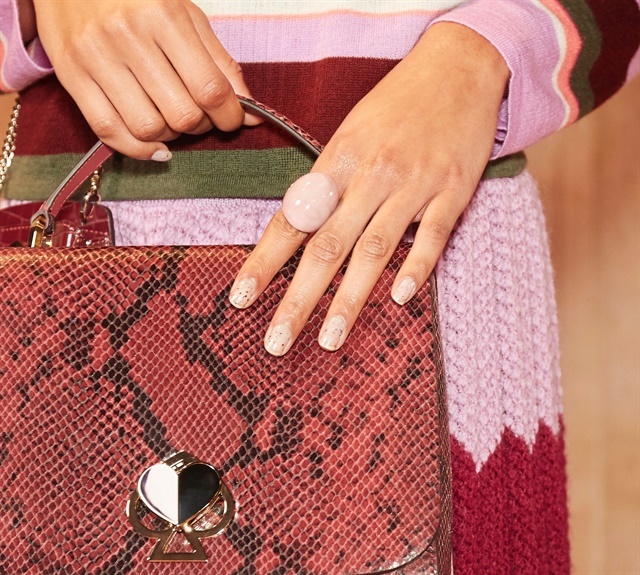 The shimmery stockings seen on the runway at Kate Spade’s Fall/Winter 2019 show inspired the “second-skin glitter” manicure created by Julie Kandalec for Essie. 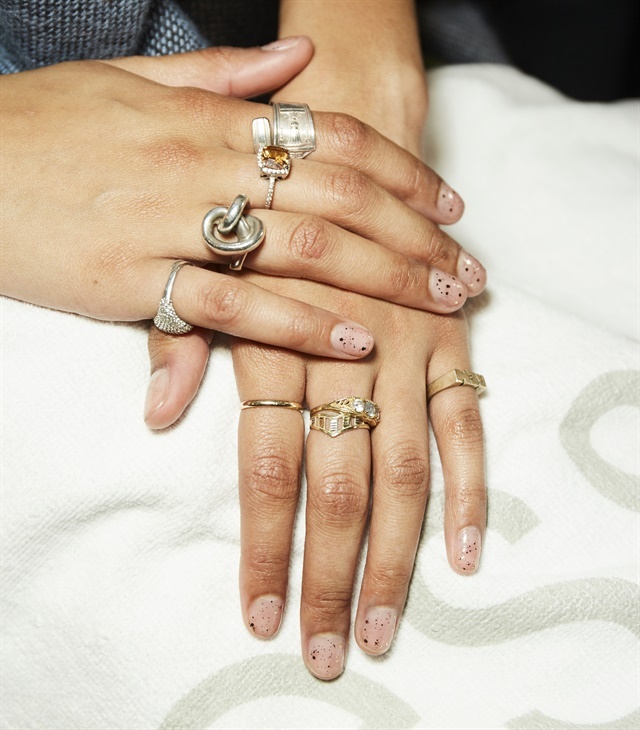 “This nail art is a more subtle way to wear sparkle,” she says. 1. Apply Here to Stay base coat. 2. After removing the polish brush from Summit of Style and wiping it clean, dip it back into the bottle to pick up a small amount of bronze glitter. Dot the particles across the nail and spread them evenly. 4. Once dry, moisturize skin with Apricot Cuticle Oil. Khaite's Fall/Winter 2019 collection taps into the various stages of the American suffragette and the era when women began to travel more frequently. 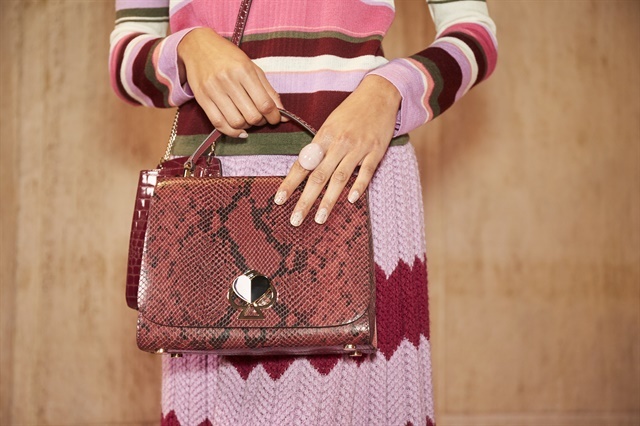 Inspired by the handbags (i.e., luggage) in the collection, Rita Remark for Essie mirrored the logo stamped on these accessories by crafting a K on each model's left index finger. "It's feminine and understated," she says. 2. Add one layer of Skinny Dip to all nails. 3. Using a fine detail brush dipped in Licorice, draw a K on the left index finger. 4. After the K dries, apply Speed.Setter top coat. 5. Finish with Apricot Cuticle Oil. See more Fashion Week nails in this gallery.